It was the start of the great Passover celebration, and from all over Jews were pouring into Jerusalem to share in the festivities. It was on this first day, a Sunday, that Jesus entered Jerusalem riding on a donkey. . . The air was filled with excitement, people will shouting “Hosanna! Blessed is the king who comes in the name of the Lord! Peace in heaven and glory in the highest!” People were throwing their coats on the road and waving palms in the air. Everyone else was rejoicing but Jesus was weeping. Jesus says in verse 42 “ if you, even you, had only known on this day what would bring you peace — but now it is hidden from your eyes.” and He wept. To better understand this, we must first understand the reason why the Jews were celebrating. In the history of the Jews, when a king comes into a city to bring peace, he comes in riding a donkey or a colt and not a horse. The people waving the palms actually symbolizes that the people were showing their support for the new king, pledging allegiance to fight in battle with him, that they were ready to take up their swords. When Jesus entered Jerusalem, the people did not welcome Him as their Savior but rather as the new king who will lead a revolution against the Roman rule. They welcomed Him as an earthly king who would re-establish the throne of David and give the Israelites the freedom from foreign rule. Jesus knew the reason they were celebrating and that was why He was saddened. Because He knew they still did not understand what He had come for. He knew what was going to happen in the next few days — He knew that it would be these very same people shouting Hosanna who would in a few days would be shouting “Crucify him!”. He wept because He knew that they did not understand. Jesus did not come to free us from any earthly rule, but rather He came to free us from spiritual death so that we can be reconciled to God. But the people did not understand this and so they continued to wave their palms. Believing that Jesus came to lead a rebellion against the Romans. They waved their palms because they had a different purpose in mind. . . They wanted a revolution. They waved the palms because they wanted something for themselves. But Jesus had been teaching us all along that He came to bring the kingdom of God. Matthew 5:43-44 and Matthew 5:38-41, He taught us how to be a part of the kingdom of God here on earth. He was teaching us how to be Christ-like, how to become totally obedient and surrendered to God’s will. This was God’s agenda. To reconcile us back to Him, to bring us back into a relationship with Him through Jesus Christ. This is still His agenda for us today. 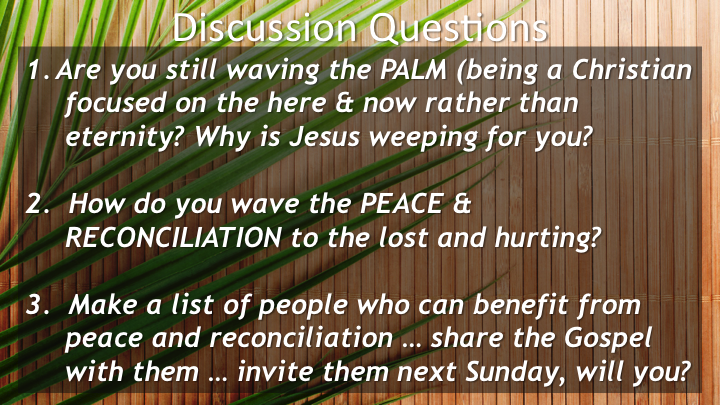 . . And yet like many of the Jews, we too continue to wave the palms because we have our own agenda in following Jesus. We only obey God’s will when it suits our purposes forgetting that more often than not God has a different purpose for us in His plans. We have been reminded time and time again that our God is more than enough to supply our needs. Philippians 4:19 reminds us that “my God will supply all your needs according to His riches in glory in Christ Jesus.” and yet we go about our daily life scampering and forgetting this promise. God has His purpose for us and part of that is for us to be a part of His search and rescue operations. We have been commanded to Go! And make disciples. . . To make Him known to those who are lost. Are we taking part in His purpose? Or do we continue to wave the palm with our own purposes in mind?